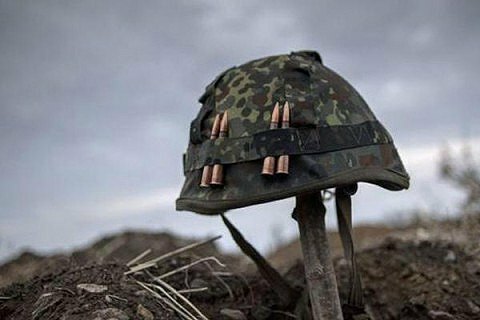 Four Ukrainian servicemen were killed in a heavy engagement near Zholobok, Luhansk Region on the morning of 23 August. "Unfortunately, Ukraine has suffered irreversible losses. As a result of a five-hour fight, four Ukrainian servicemen were killed, seven other our defenders sustained wounds of varying severity," a spokesman for the Defence Ministry, Dmytro Hutsulyak, said. President Petro Poroshenko described the engagement in his speech at the opening of an arms show in Mykhaylivska Square in Kyiv. "At six in the morning, Russian troops represented by a reinforced company in the strip of attack wider than 1 km with heavy artillery support and using large-calibre artillery and mortars attacked the positions of the Ukrainian Armed Forces near Zholobok," he said. According to the president, at least eight enemy troops were killed and 11 wounded. The line of contact was restored. According to earlier reports, Senior Lt Heorhiy Olkhovskyy from the 128th mountain infantry brigade was killed in the early hours of 23 August.